Here’s the real difference between Fantasy Island, the Erie County Fair and the Big Tree Carnival. Fantasy Island served the broader community. In professional baseball terms, it would be considered AAA. The Erie County Fair, despite its commonly used “Hamburg Fair” nickname, served an even greater region. It was the Big Leagues. That it was in our backyard only made us prouder. The Big Tree Carnival, on the other hand, well, that was home cooking. A sandlot game, if you will. That it was small made it better. It was for the local community. It was an event shared by everyone who mattered, and no one beyond that. Sure, outsiders could come, but they would be our guests. The Big Tree Carnival was the perfect place to catch up on the summer doings of our friends, ride a few rides and maybe win a gold fish that might actually remain alive by the time we got home, no doubt late into the night (but not as late as our parents). That was then. Today, the Big Tree Volunteer Fire Company only marches 5-10 times a year.3 Insurance rates make it difficult for smaller carnivals to raise the funds they were intending to raise. The Big Tree Volunteer Fire Company decided long ago to pursue alternative fundraising strategies and the carnival, along with the community bonding it often brought, vanished into the realm of memory. There remain, however, bastions of this bygone spectacle. Today I live in a small town. It’s called Mendon. It’s on the south end of Monroe County abutting both Livingston County and Ontario County. It’s got about 6,000 people. It’s not the most rural town in Monroe County, but it’s close. The Thruway runs through the north end of town, but with no on or off ramps, all it does is take up space. There’s no direct interstate access. There’s only one other east-west road through town, but we do have two north-south roads. We might not have many roads, but we do have a fireman’s carnival. The Mendon Fire Department was established in 1932,4 four years before the Big Tree Volunteer Firemen’s Association.5 They’ve been having carnivals for as long as I can remember. In fact, I started attending in the 1980s when the Fire Department was still located in the old Mendon Academy, a two story cobblestone former school house with space for only two bays. There wasn’t any room at all, not even for a carnival. The lower parking lot of St. Catherine’s Parish consumed all the land immediately behind the Firehouse and, back then, the church itself nearly abutted the firemen’s abode. I moved back to Mendon because of the community spirit I witnessed in that first carnival. In my mind, working together as a community, crossing organizational lines and placing common sense ahead of bureaucratic red tape spoke to a character well worth becoming part of. That was Mendon. That is Mendon. That remains the spirit of the Mendon Carnival. The Carnival has the luck of being one of the first such events of the year, occurring annually the first week of June. It coincides with youth baseball playoffs, the slowing down of school and the beginning of summer. Nearly every community organization is involved in some way with the Carnival. They gladly work with the Fire Department and the Fire Department gladly shares. The Mendon Fire Department moved a couple miles down the street to a new Fire Hall in the 1990s, one with a much larger field. This made for both a bigger carnival and a longer parade. 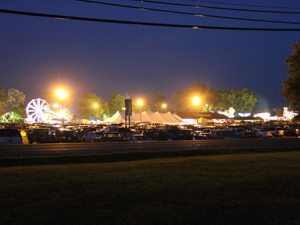 Unlike the Big Tree Carnival, where it seemed the parade kicked off festivities, the Saturday night parade at the Mendon Carnival occurs on the last day and gives one the impression of a climax, rather than a beginning. As the area’s first summer carnival, the Mendon Carnival attracts Fire Departments from across the region. Sometimes the parade takes three hours before the last sirened vehicle turns off its flashing lights. I’ve had the honor to march in these parades with Pack 105 of the Cub Scouts, Troop 105 of the Boy Scouts and even CougarTech Team #2228, the High School Robotics team. Seeing all varieties of townsfolk along the parade route – not to mention the many picnics hosted in the nearby homes – only reaffirms the sense that the Mendon Carnival brings the whole community together. But it’s not just the parade, it’s the actual carnival. Various local volunteer groups occupy the many booths and food stands along the Midway leading up to the rides. You can relax as you walk through the grounds, knowing everyone around is your friend, knowing most of the money you are spending is going to some worthy local effort, knowing the smiles of the kids you see are genuine, etching memories they will forever cherish. This is the “quiet” I referred to earlier. The raucous? Well, it’s a carnival. And Saturday night after the parade, when each Fire Department’s band “competes” with the other, that’s raucous. And that’s part of what the fun of a Carnival is all about. And everybody is your friend, even if they are from a few towns away. That’s the essence of a small town carnival, and the Mendon Carnival captures it oh so well. If you have a small town carnival, then go. If you don’t, then comes to Mendon’s. We’ll be glad to have you. The small town community atmosphere reflects a certain American persona. It’s special. It’s ours. But don’t take my word for it. Our next chapter trumpets what folks around the nation are saying.